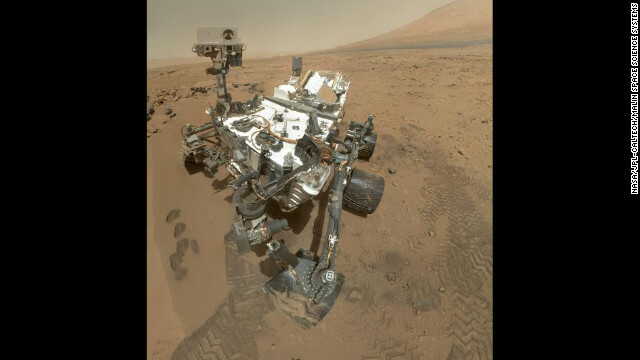 A self-portrait of the Mars rover Curiosity, taken on October 31. Drumroll please. The results are in. Chris Webster of the NASA Jet Propulsion Laboratory in Pasadena, California, is the instrument lead for SAM Tunable Laser Spectrometer. He promised attendees of Friday's press call that he would answer the question eventually. But the bombshell was delivered in one sentence: "We have no definitive detection of methane." This is perhaps a disappointment for anyone who thought signs of life would come this early in Curiosity's two-year mission. Curiosity is using the Sample Analysis at Mars instrument (SAM) to help scientists probe the atmosphere. Methane gas could be a key indicator of the planet's habitability. About 90% to 95% of the methane in Earth's atmosphere is biologically derived, said Sushil Atreya, a University of Michigan researcher and co-investigator for SAM. "It’s not really a surprise to us. We went there with no preconceived notions of what we were going to find," Atreya said. Even if there were methane, however, the gas can be produced by nonbiological sources, such as volcanic activity. The story isn't over. Curiosity landed on August 6, so it has time to take samples and come up with a more conclusive estimate for the amount of methane in the Martian atmosphere. The scientists took into account relatively large margins of error for the analysis. If there is a source of methane, it takes about three months to distribute it from the source, scientists said. Curiosity will continue making atmospheric measurements and may find methane in the future. "We’re going to keep looking in the months ahead," Webster said. "Mars, as we know, may yet hold surprises for us." Twitter was buzzing with the news. @SarcasticRover tweeted, "So far Mars has no methane. It also has no lemurs or apples. Also lacking in homemade soups. It's a pretty empty planet." An analysis of the isotopes in the Martian atmosphere reveals that a portion of the atmosphere may have been lost to space. Scientists theorized this based on the presence of heavier isotopes of carbon in the atmosphere's carbon dioxide compared with the ratio of heavier to lighter isotopes estimated to have existed when the planet formed. So what happened to the gases? There are several possibilities, says Laurie Leshin, researcher at Rensselaer Polytechnic Institute and co-investigator for the SAM instrument. For example, large impacts can blow off large parts of the atmosphere, Leshin said. There's no protective magnetic field around the planet, either, so solar wind ions can knock things off, she said. NASA's next step for the Red Planet - the Mars Evolution and Volatile Evolution Mission, aka MAVEN - will try to understand those mechanisms in more detail by examining the gases escaping from Mars today, Leshin said. MAVEN will involve an orbiting space probe, which is scheduled to launch November 2013. The five gases most prevalent in the Martian atmosphere are carbon dioxide, argon, nitrogen, oxygen and carbon monoxide, scientists found. In general, the results are consistent with what the Viking mission found in the 1970s, except that Curiosity found a 35% lower atmospheric abundance of nitrogen. Atreya said it's possible that the proportion of nitrogen in the atmosphere could change seasonally; there just isn't any information on that yet. With more measurements over time, the latest and greatest rover may provide further insight into whether that's true year-round and what it means. Please don't tell the government there is weed on Mars, or they will figure out a way to spend more than the $1000.00 per hour. That they spend on me, trying to bust my nickle bag. Finding no "life" on Mars should open a gateway to send thousands of probes wiith bioengineered life forms that could thrive on the environment present on the planet. If successful these "plants", spores, fungi....whatever we decide.... would assist man in the developmentof permanent colonies . Now we are exploring yet trying to avoid contamination problems ...to effectively colonize we must introduce lifeforms if none are present. Lets conquer Mars so we can tax the wealthy who live there. This will solve the 4 billion dollar per day cliff we are headed for. So lets join hands and move forward together. Thank God there is a way out!!! Come on people look at your foolishness. Everyone acts like the bible states life is only from earth. I am a Christian but i cannot argue that God made life on earth only show me one place in the bible that states such a thing. God is the creator of Heaven and Earth, what makes our little blue ball so special that God could only put life on one planet. After all God can do whatever he wants. Do I think their is inteligent life out their suh as aliens, im not so cure, but i dont know and dont pretend to know all things about what God has or has not done. If life does exsist which I would like to belive that it does i think it will most likely be in the form of plants, mammals, dinosures, fish, and other cool life that God would love for us to learn about. The more science teaches us the more sure i am their is a God. For anyone to claim to know God but reject the fact that the bible says "by him all things were made that were made. So if science proves life exsists this would not question my faith, the question is would it question yours and if so you might want to reconsider what you belive becuse your faith cannot be based on ideas that do not derive from the bible. "there is no life on other planets" is one of those ideas i would throw out, because when they prove you wrong what will you stand on, or will your fiath crumble... Last thought .... for those who argue about life and the bible if life was found what would be your answer to this? Well, although the Bible does not explicitly mention that God (Father, Son and Holy Spirit) created "Life" ONLY on Earth, the entire "narrative" in it revolves around "Life on Earth!" The Bible describes the "beginning and end of time" pertinent to "Life on Earth" from the "story of creation" in Genesis to the "apocalypse" in Revelation! That implicitly indicates no other life forms anywhere else are tied to this timetable! Also, the Bible mentions ONLY Angels, Humans, Animals, and Plants as created living beings! Let alone other planets, bible does even mention the existence of Americas. If early fundamentalist Christians had not destroyed scientific books by Greek scientists like Ptolemy, we would have discovered that the earth is round a lot earlier. To seek answers to scientific queries in religious books seems like barking at the wrong tree. Does anyone know if the rover scientists tested Curiosity's gas sensors with their own flatulence before it was mounted on the rocket? Did they damage the gas sensors and have to replace them? Just wondering. Look At It This Way, Here On Earth, We Have The Footprints Of Our Ancestors Journey's Across The Planet. Only To Evolve To The Technology Of The Wheel, Which Left It's Wheelie Prints On The Surface Of Mars. This In Itself Is An Astronomical Achievement. Makes Us Truly Ponder, That Humanity Has Moved Up A Notch. Science is against the Will of God! It is a sin to send this Souless robot there! Is there a limit on the amount of text?! NASA's strategy in their search for life on Mars had previously been "Follow the Water", but now it is "Follow the Farts"
There is no life on mars, God only put life on Earth! Common sense and selective religious views never mix. Spot on Culpepper. Read your Bible again. The six creative periods occurred BEFORE God gave man his reckoning of time. The six creative periods (called "days" only for lack of terminology back then) could have been ANY length.......including BILLIONS of years. Once God gave man his reckoning of time, then the Bible records 4000 years from Adam to Christ. But we can put life on Mars, cant we? WAY too many "rational" and "logical" know-it-alls packed into one message board. This has got to be the funniest, most arrogant group of comments I have ever seen. Maybe we should hold-off on gracing other planets with our "intelligence", at least until this generation ends, or at least until this ridiculous election (which the rest of the planet always seems to suffer for) comes to a close. First enjoy the broccoli cheddar soup, the methane will follow. I'm with buzz. figuratively & literally. All that has to be done is send up a few cows, some grass and call it good. Grass gives them oxygen and food.. Cows produce the methane.. All good. That will require a small dome with grass field plus cow in it. There should be a vent that can open and close from time to time. Its might take a years to years by filling Mars with cow's fart. They may have not found methane, but physicists at the prestigous Sarah Palin University report uncovering the remains of an ancient trailer park and nascar track, proof that eons ago the Red Planet was inhabited by alien tea party patriots. And you're a waste of oxygen. They said the same thing about gasoline in the late 1800's and airplanes in the early 1900's. I think the problem is that you have a poor imagination. Fortunately, there are many people who are able to see how Mars represents a potential for mining and colonies. It isn't a lot of money, and this can help set the future for a base to be built there one day. And tax payers benefit more from NASA than any other organization. Mars is a no farting zone. @Lifeasweknowit: Adam and Eve may not have been to Mars, but God stopped there before coming to earth. Great! No life! We can do whatever we want to the planet now! Launch the hotels and McDonalds! Come on Curiosity, try harder! Get with the program! Why would you hope so,unless it's to reinforce your belief in ridiculous religious nonsense? Look, it's simple. Six thousand years ago God decided to create the Earth so he reached over and grabbed a bunch of dirt and rocks from Mars, one of his earlier experiments that didn't work out, and formed it into our planet. So the dinosaur bones and other items including rocks and stuff, that all appear to be millions or even billions of years old are really from Mars and came over in the big pile God used to make Earth. So Earth really is only six thousand years old. See how easy that was. Yes. Because we searched one planet out of the possible trillions of planets in our one galaxy out of the possible billions of galaxies. At least science has the ability to prove itself wrong. Religion doesn't seem to be able to prove anything except for the fallibility of man and itself. "Could science finally be proving itself wrong on this issue?" Uh, no. Look up the negative proof fallacy – which was originally recognized as a logical fallacy using tools for rational analysis developed by the church several centuries ago. It's often summarized as "Absence of evidence is not evidence of absence." Wrong. The Earth's magnetic field MAY be heading for a field reversal, which happens every few hundred thousand to a few million years. The field weakens temporarily while it does so. It will then spring back to full strength. The Earth is ten times more massive than Mars and can retain heat far longer as a result. Actually it's a bit under 10 times as massive." Well, well, @Ralter: "a bit under"? And somehow that makes all the difference to @Leif's comment? So, surprise, there is no evidence of Martian farts. I guess the reason you and Paw don't realize that the reason you can spend the evening amusing each other by lighting your farts, is that they are comprised of (that's a big word for made of) methane. I'm still betting the rover will find something incredible. And even if it doesn't, this mission is invaluable as the precursor to a Europa or Enceladus mission, where there is undeniable liquid water. They're looking in the wrong places. They need to search in and around the volcanoes where it was warmer for life for a longer period and still spewing out chemicals like sulfur and methane. Gee – you should contact the NASA science team immediately and inform them of your insight. I'm sure they no nothing at all about life or volcanoes or Mars. Ummmmm, the volcanoes aren't active and haven't been for a LONG time. most spellcheckers i've seen only look for misspelled words and don't find grammatical errors. Dave did you know that you are to use capital letters at the beginning of sentences? I will tell you exactly where the Martian atmosphere went, it once had a spinning iron core that slowed down and stopped collapsing its magnetic field once this happened solar winds blew away the atmosphere, and the same thing is going to happen here on Earth, our core is slowing down too and our magnetic field is weaking fast 10% in the last 100 years, already the magetic field here is becoming unstable, it happend sooner on Mars because it is 1/3 the size of Earth. The Earth will become Mars like probably in just a few centuries to one millenia at the most, all the more reason get moving with human space colonization not of planets but of space itself in artificial environments that can be controlled other wise what was the point of everything humans ever did if we arent going to take our own survival serious. The Earth reverses its magnetic field every once in a while. It comes back though. People will acually believe speculative conspiracy crap like this, but won't believe in well established global warming as the immediat threat. John, stop spreading such garbage. The Earth's got billions of years before it changes due to magnetic field dampening. Actually the last magnetic reversal was the Olduvai event at 1.7 million years ago so it could happen again anytime. Actually it's a bit under 10 times as massive. What they really need to do on Mars is DIG! You need an archaeologist rover that can go around and do some serious digging, there may well have been life on mars millions of years ago when it was more earthlike, so you need to dig for fossils, crack some rocks open and look for fossils. as I read this, I just farted. talk about elusive methane! Careful now. No sparks for at least a minute. take the next shuttle to Mars! Need your help! I'm really hoping they will find themselves a nice bowl of french onion. Simply propagate the entire martian service with baked beans. Done. Surface even. Man what a night. I still can't figure out how you can have oxygen on a planet that doesn't have life. Doesn't make any sense. Even if there was some form of water or microscopic life...when the water dissipated and life died off...so would have the oxygen. Are you saying you think the oxygen would die, or need to be replenished? It isn't alive. It's a gas. It's manufactured in stars and disbursed via supernovae, like the other elements on the periodic table. Plants manufacture oxygen on Earth by using up the carbon in CO2 for growth, producing oxygen as a waste product – animals use oxygen but give off CO2 as a waste product – a nice little quid pro quo we've got going with our plant buddies, but not required for the presence of oxygen in and of itself. Oxygen is required for life as we understand it, but life isn't required for oxygen. If you believe evolution not only occured once but many times your a blinded fool oh sure you may believe it but have you ever once looked at how many millions of things have to go right for evolution? The irony of evolution is this they can't believe everything was creating but everything just magically appeared odd right. Think of it like this in this perspective out of the millions of stars and planets just in our solar system somehow the right molecules landed in the right spot earth just so happened to need everything to sustain life even more so the earth produced food and water to support such life how man rules over the beasts and how we are the only creatures with a few things animals don't have a concience a spiritual need and reasoning power all these things animals do not posses you see if evolution is real then all the other animals on earth would have evolved to a human like thinking form long ago it's only logical but regardless of what science tells you they have never found proof of one species changing from one to another completely different creature they have only been able to prove adaptation. Those that think people thought the earth was flat where Christians are sadly mistaken read Isiah it's right in the bible and it gives a good explanation of what the earth is a spherical shape that hangs on nothing this is long before science ever figured it out now I wonder how could someone so long ago could have known about the earth. Conclusion if there is life out there we won't know unless God reveals it to us guess you will just have to study the bible and wait for the big war thats coming who like Noah goes today and warns people of the fast approaching disstruction of the wicked? And who are like those in Noahs day who laughed at him and said why should we listen to it has never rained a day from the beginning of man? Don't mock my grammar as long as you get the message thats all that matters. I get it. You're stupid. Nothing like basing your life on fantasy and fiction ehh Phazon? It's sad that people who think of themselves as intelligent, logical, scientific humanbeings are so willing to throw out the Biblical possiblities. Phazon is correct that there is no solid evidence proving macro evolution. There are many strong scientific minds that disagree with the process. For example, Dr. Hugh Ross who wrote the book "The Creator and the Cosmos" has some compelling truth on how the latest scientific discoveries reveal God. It really is time we stop teaching our children that evolution is a fact, because it is still a theory. The problem is that during the past 100 years science has been so desparate to disprove the existence of God that it stopped being objective in its findings, and this has created an obstical for true scientific research. Think of it this way. Imagine a police detective that is so certain that a crime was commited by a particular individual that he stopped looking at the facts. In the case of evolution, it can't explain the Cambrian explosion, that true evolution would require more time than the planet Earth has been able to supply, that we haven't been able to replicate the process of first life in the conditions that existed upon the earth, that there is no fossil evidence of macro evolution, and then we have the eyeball. Chalres Darwin himself said that evolution can not explain the complexity of the eyeball. So Phazon. My hat is off to you for being willing to state an opposing arguement. Pokeydok. The Bible has yet to be disproven as fact. The seven days of creation for example coincide with the Big Bang Theory. Including the fact that time itself began when the universe was created. It was the first book that placed the order of creation correctly. It was the first book to explain that the universe was laid out like a blanket. It was indeed the first book to show that the Earth just hangs out there as Phazon said. Hmmm. Archeologically, it has yet to be disproven. Prophetically, it has yet to be disproven. Also, if you take the time to read it and you realize that it was written over centuries by many different people, you will really see the miracle of this. For example, read Psalm 22 that was written 1000 years before the death of Jesus. Once again, hmmmm. Take time to research all of the facts. I used to be an evolutionist, but I took time to do the research. Real knowledge comes from being willing to look at all of the facts. if you studied grammar and spelling as much as you've studied the Bible then perhaps i wouldn't have stopped reading your post after the first couple of sentences. @rabies... " The Bible has yet to be disproven as fact". Couldn't I also argue that evolution has not been disproved, therefore it exists? Seriously? Sorry for this everyone, but I find it incredible in this day and age people still exist that think the world is 6,000 years old and people used to live to be 600 years old. I get that it feels good and it provides you all with a sense of certainty, but I hope you understand its rediculous. Outside of the obvious problems in any argument you might come up with, I challenge you toactually read the bible from cover to cover and have a look at everything you "choose" not to believe, while spewing all of the other crazy nonsense you cling onto in discussion boards. @Yep I actually applaud your reasoning on this. Although I believe there is much more evidence to support the Bible than there is for the Theory of Evolution, you make a good point. You took the challenge of looking at the problem and doing a logical comparison. With that in mind, let me pose a quandry your direction. You obviously have a logical mind. If you were walking in England and were to come across Stonehenge, would you look at it and say,"Oh, these rocks must have formed this way over the period of eons. How amazing is that?" Or, would you say,"I wonder why someone set these huge stones up this way?" We do not know who set it up or how it was set up. Yet, I've never heard anyone say that it must have been by pure chance. Yet, living beings are vastly more complicated, and we are willing to say that it was by pure chance. Without the smoking gun to prove evolution as fact. Then my question is how can we teach it as fact. On the other hand, the Bible does have first hand accounts of its validity. The question of Evolution is not Evolution vs. the Bible. The question is whether or not there is really enough information to prove it as fact, and that is sadly lacking. I have noticed a lot of one line quips, but I am still waiting on the logical arguments for evolution. YEP has been the only one to offer a logical argument, so far. I appreciate that. But why does it have to be either the Bible, or Evolution ?? Throughout history, there are thousands of stories about creation. Personally, I feel there is far more archeological evidence for the Sumerian legends of the Annunaki, sentient beings from another world who came to earth, and conducted a genetic experiment which resulted on the creation of humanity. Why can't this theory be on equal footing with the Bible and Darwin ? For that matter, why does it have to be the God of the Bible? Suppose Divine Creation is true, who says it has to be the Christian God that did it? Why could it not have been Ra, or Zeus, or Hecate, or even Allah ?? None of those can be disproved either. Spiders can reason, and I think they have a spiritual love of Cthulu. There are no little green men out there. Sorry to tell you. If you believe in aliens, you might as well believe in angels. At least if you believe in those, you tend to be a nicer person. sentient life exists elsewhere: this general statement is almost certainly true, considering the staggering size of the universe. Whether they are even technologically advanced enough or will ever be (or we will ever be) to communicate and explore space is what is extremely unlikely. What we know for sure is that planets are a perfectly ordinary feature of star systems, and that our star is a perfectly ordinary example of the 200 or so billion stars in this galaxy; a galaxy which itself is perfectly ordinary and one of billions. We also know that all that's required for life is the right combination of chemistry and conditions. So while I agree with you that stories of "little green men" visiting Earth are made up by bored or crazy people, I must also place into the same category anyone who willfully refuses to accept the possibility of life elsewhere in the incomprehensible vastness of the universe. There is no evidence of these "angels" of yours. There is abundant evidence that the universe is an immense place full of ordinary galaxies, stars and planets, just like our own. If we "know that all that's required for life is the right combination of chemistry and conditions", how come no one has been able to synthesize new life in the laboratory, by design or by accident, apart from using existing components taken from existing living cells, and using entire living cells to manufacture them? How can we know, when we cannot even define what those conditions are? I was a little jarred recently to read my son's 6th grade Glencoe science book that states categorically that spontaneous generation has been "proven" impossible, then to postulate evolution of the first living cell from non-living matter (both in the 1st chapter), which is... spontaneous generation. Before someone tells me how dumb I am for asking, I got "A"s in pre-med molecular bio at the University of California. Duh. We just haven't figured out how to speed up a few million years of chemical interactions into a few years; wait long enough and there will be more evidence on that. I think the point SB was trying to make is that life exists here and there is nothing particularly extraordinary about our solar system...we KNOW there are billions of others out there and it only makes sense to assume some are like ours. The reason we have not been able to reproduce life in the lab is that clearly we still don't understand everything about the process (at one point in history the same could be said about many other scientific discoveries). People search for certainty and obviously the bible is the most popular source of certainty, but in the end, its just not that simple. I think the point is that if you look at it rationally, its very difficult to ignore the probability of some sort of life (intelligent or not) somewhere else in the universe. Build huge power plants close together in multiple places. Place lots of power plants in a circular motion around the poles. Build other polluting power plants around the equator of Mars. This would create a magnetic field. Once this project is complete, we need to transport some cows to Mars. Another ship would drop a large shipment of goods for the cows to graze on. Keep replenishing the cows and the feed. Before you know it there would be plenty of methane in the atmosphere and Mars would begin to warm. The cows would also be dropping cow paddies, therefore fertilizing the soil. After all this man may begin to walk on the face of Mars just as we do here on earth. Nice of you to assume it's ok to build all that junk in my backyard. Typical humans. wish i could argue with you, but im becoming quite impatient myself. and how was this self portrait taken ????? Mosaicing and reprojection to a different viewpoint. I agree 100 percent! This quest to find life or prove evolution(which really what it is) is fruitless. Why not put this money where life can be found, like the 95 percent of the ocean that has nopt bee explored! I was so amazed about the life forms found in the extreme deep! They look alien in nature! You mean, like, through an entire government agency called the NOAA? Or are you referring to the already substantial amount of money NASA already spends on oceanographic research? That thing can shovel my martian driveway. I believe the the human foot print upon the martian surface is being lied about by the US government because of military and economic prospects. The amount of withheld information is large and wide spanning. These are my beliefs, and I would only be crazy if I intended to divert the selfishly limited fact finding and bubble reality constructing human beings who might read these words. You will read what you want out of these stories, and comments. Don't let me interfere. I just wanted to have said that for the records. your opinion is based on exactly what evidence? The evidence of pure insanity, perhaps? The lack of evidence is my evidence. If we assume a law of space exploration that suggests over time the science of space travel advanced at a rate comparable to an average of other engineering science ie train travel, air plane travel, submarines, bridge building, clothing manufacturincg etc We can easily notice a void of known space science ability. If you project space travel however at similar emerging sciences you not only notice the same void, but the chance of such a large cover up my quite simplistic assertion of a Moon base and man presence on mars because the tip of the iceberg of unknown space science. When you call me insane it hurts my feelings very much. This only proves that Aliens don't fart. Perhaps alien's fart H2 or Argon? why have they not planted trees and vegitation??? I think Mars had life and had trees and plant producing oxygen but they must have died and carbon dioxide built up and plants dying maybe created nitrogen and oxygen became gone and then maybe the plant life burned up and produced all the carbon monoxide. Maybe this is what we should look at and not let it happen to earth. Plant trees or oxygen producing somethings. The picture you see is made up from a few small pictures. When you stich together those pictures, elements like the boom can appear to be missing. If I was there it would find methane. Agree, drill or find caves to seal off and make habitable. We must habitate Mars because..well , just because. I'm actually from Mars. Us Martians have all you Earth people fooled. We monitor your television news broadcasts (usually DirecTV because it's cheaper), and then when we hear that you guys are coming over yet again, we start laughing and cracking up (we are such practical jokers). Then, we hide underground, just to mess with your heads. Our planet Mars, is actually a very lovely place, when you Earthlings are not here! You screwed up your own planet, we don't want you screwing up our's. By the way, we love Seinfeld! You know, I understand pelpoe's choice to be Christian or their choice to be Atheist, but seriously, both groups, why can we not just practice or not practice religion in peace? Atheists: Christians are not trying to oppress you. Get over your grudges from the 12th century. PS why are you even watching this video? Christians: Love as Christ commands, let them live out in peace. Nothing would grow. Mars doesn't have a magnetic field to protect it from solar radiation. The radiation would kill any Earthly life forms. perhaps genetically modified cold weather plants that had traits of plants which survive along our equator and also get their fair share of solar radiation could exist in a temperate region of mars if water circulation on a micro system was provided. So with the earth atmosphere being 80% nitrogen, 18% oxygen, and 2% rare gas, what are the percentages of the five gases most prevalent in the Martian atmosphere of carbon dioxide, argon, nitrogen, oxygen and carbon monoxide. Is it hablitable? What, no cambells chunky, I'm disappointed. What a waste of taxpayer's money. It be spent on more important issues right here on Mars. ya, ya! 'it be spent right here on mars!' flagsagoofin!! So are you a Martian living here on Earth paying Earth taxes here, or are you complaining that you are a Martian living on Mars paying Earth taxes on your retirement trailer that you own here on earth? Is that done by direct deposit or do you send it here on the regular yearly shuttle? What is the current conversion factor of Martian to Earth currency anyway? Translation....This is last trip to Mars. Why don't you go research the vast number of technological advances have come from space exploration. You will quickly learn how many things you use in your daily life that have come directly from it. But the problem I have with NASA is that they deceive an uneducated population in order to get an inordinate amount of funding, relative to projects that would provide a greater ROI to our nation and our planet. For example, this article says they found no methane...and that they went there with no preconceived notions. The truth is that if they had found methane, they would be trumpeting it to the world as possible evidence of past organic life...and immediately return to requesting funding to send humans to Mars. As a geologist, I know full well that humans do NOT need to fly to Mars to collect and bring back important sedimentary rock samples, any more than geologists have to put themselves 10,000 feet under ground to harvest rock samples from wells on earth. The original pictures are on the NASA website. The rover took a bunch of close-ups and then they pieced them together to form the picture above. I've got to admit, it's pretty cool to sit here at home an look at the other day's pictures from Mars. No methane?? Nobody up there lifts a cheek and passes gas?? Yea, I agree!! Magellen, Columbus...all of those guys similarly spent a whole life wasting time and money. Your lack of vision is depressing. Its a whole new freakin' planet for cryin' out loud. We are bound to learn things of immense value about our own world from an examination of Mars. And it's people like you why we are behind scientifically almost a millennium. You say it's a waste of time and money, yet the people doing these things are the reason why you have all the technical comforts you do today, from air conditioning, to the darn country you live in. So go invest in your education, and learn, this stuff is more important than you think. One day, due to people like you, this planet will be uninhabitable, and we will need to find a new place to survive. So don't go opening your uneducated mouth until you realize how these important experiments effect our lives. The whole of the space program costs 6/10% of the US budget. I think you can agree that there is far more waste elsewhere in the budget which has no redeeming value. This little amount for advancement of knowledge is well worth the cost. These numbers are far off. As a percentage of TOTAL federal spending, the NASA budget is barely one half of one percent (0.5%). Even taken as a percentage of discretionary spending, it wouldn't reach 3%. At the height of the Space Race ie. 1966, NASA budgets didn't break 4.5% of TOTAL spending. This year, the NASA budget will be at a level so low you would have to go back to 1960 to find comparable outlays. That was three years after Sputnik!! Your decimal is in the wrong place. Spending on NASA is ONE HALF OF ONE PERCENT. It's not 6%, but 0.5%. You do realize that Mars contains valuable resources including water that we will eventually need...these rovers we sent over the past 15 years is just the beginning. It is inevitable that someone will be on mars within the next 50 years so stop your stupid waste of money comments and wake up. Aside from the fact that water has been pretty much leached from the Martian soil and lost as vapor to space, let's consider a scenario of bringing water from Mars to Earth. Let say that we...oh....pump and carry a volume of water equal to the size of the Goodyear Blimp...from Mars to Earth. What would that water cost to pump and return? How about 20 billion dollars? Then, once that volume of water is brought to earth, it will provide water to a medium sized city for approximately one day. On the other hand, 20 billion dollars will build a lot of water purification and sea water desalination plants on earth. But NASA never brings up that sort of detail, since it is so important to NASA that we send folks to Mars. For what exactly, they have yet to explain. ?? I am a conservative and believe we do not spend enough money on endeavors such as this. I for one want to leave this rock to all the Left and Right wing nuts. Oh my stars! The rover is only 3 months into a minimum 2 year mission, Stan. If you want it your way, then go down to Burger King and stuff that mouth of yours with their full artery-clogging menu, and leave NASA to the real work. I would much rather see my tax dollars spent on space, science, and technology than on an endless stream of wars. Without, Science, NASA, and the space program, you'd be typing your comments about 'waste of money' on a rock. I had bet $500 they would find soup; now I feel foolish. Well it's beginning to look as though any methane they do find is going to probably be volcanic in origin. Not looking good for life, ancient or otherwise since volcanism can account for everything they've got so far. I honestly wouldn't doubt it if life on Earth originally came from Mars. Humans lived there, and destroyed that planet, then they came to earth and terra-formed it, and they were our original ancestors on Earth. The point here is that scientist speak the truth whether it is what they wanted to hear or not. It's what the evidence supports. So when they talk about global warming we should listen very closely. It's what the evidence supports. There is a difference between data and conclusion. The sun can be observed rising in the eastern sky every morning. Throughout the day, it travels westward climbing higher and higher as it goes. And, each evening, the evidence is clear that the sun sets below the western horizon. The obvious and unmistakable conclusion is that the sun orbits the earth. Of course, we know that this is not the truth. In truth, the earth rotates which gives the appearance of the sun's movement. But, for many generations, the sun's daily journey through our sky was indeed seen as irrefutable evidence that the sun orbited the earth. The observation of the sun rising in the east, of it traversing the sky, of it setting in the west, all of that evidence is absolutely true. There was no mistake in the measurements and nothing wrong with the observations. It was the conclusions that that evidence was used to support that turned out to be mistaken. Will this grand theory called "global warming" ultimately be found to be true? Or will it be yet another in a long history of science misinterpreting evidence? We don't know. Only time will tell. The point that you obviously missed – or chose to ignore – was that science is self-correcting. In other words, it has no need to try and hang on to old theories that no longer fit available evidence. There are a relatively small number of theories that were simply thrown out and replaced by an entirely different theory. Instead, the vast majority have evolved as more evidence has been discovered, and therefore the conclusions have evolved. The conclusion then, should be that the probability is that the theory of climate change being at least partly due to human activity has some degree of truth – rather than the black and white preferred by most of the ignorant masses of either 'true' or 'false'. Except that the evidence shows that the sun travels in the sky. We know that not to be true. Further and more advanced observation shows us that it's not the sun that travels, rather the rotation of the Earth makes the sun _appear_ to be traveling. Not trying to be demeaning. My point is that data doesn't always equal the right conclusion. Sometimes, well – a lot of times, there is more to the story. You completely fail to take into account the amassing supporting evidence. Your argument focuses on one observation. Galileo came along with supporting evidence that the path of Mars and the phases of Venus could only be explained by the the heliocentric model. Yes science can be misinterpreted and theories dismissed, but there is already a vast amount of supporting evidence that climate change is being accelerated by our habits. Most people choose to ignore it and demonize those scientists just as the religious did Galileo. fire a laser" Get real. Do we need our Jewish Military to lead the research? Firing lasers and looking for diamonds. Yeah that's what most people would do. Yeah right. Please put your tin foil hat back on and go hide in the closet for another 50 years or so. Yup. The freaks are definately out, and THIS one is further out than most. Looks like we found another tin foil hat wearing crack smoker! So, NASA is now part of a vast government conspiracy to deny the existence of methane on Mars? But to what end? For what purpose? I don't trust the government when the availability of information is limited to sources which are funded by the country that has every reason, ability, and demonstration of lying in the past. If this is a scientific mission I see a huge variable for the second hand scientific observer. I suppose I should also mention I don't use illegal drugs, and know how hopeless thin aluminum / tin foil is against the air to surface weaponized voice to skull wave air pressure effect technology if it is directed at your head. I assure you to stay on constant guard for the "weirdos" but don't be confused by well formed dissent. Wack Jobs have quicker defenses against slander, but my questions are of the rudimentary facts, and are thus persistent. I need not mix it up further with the secondary conversation my inquest has spurred on because proper victory in terms of online commentary would have to be of years possibly decades. The reason for the suppression of debate is previously characterized by me as Jews just being Jews. And I'll wait until your Jewish military run country is looking the other way and once again ask about the moon base, and actual state of the martial surface, as not described by jew-military -bot -2. If the rover finds a Martian skull the public will never hear a thing about it. Explain. Why would NASA withhold this information? If they were to find a skull on Mars you would know it the next day. It would be immensely beneficial to the NASA program to have that information released. GUARANTEED the public would demand we increase the budget for NASA to send people their to investigate first hand. I would even go so far as to say that you would see the government release Mars Bonds to the public to help finance a colony. .....almost forgot about the little guy. So...it says we can't survive there yet? Money well spent. Ok, where is the arm holding the camera that took the self portrait? I don't even see its shadow. It obviously used the self-timer. It's called image processing. The camera is mounted near the center of the vehicle and can pan completely. Images are mosaiced together and reprojected to provide an image as it would look from a different viewpoint. That would make sense. But then the camera must be on an extendable or retractable boom that can be raised above the Rover, so that it can look down on it, otherwise it should not be able to show some of the details that are in this picture and I would think that when it is finished it would fold/retract down and hence there would be no evidence of it in the photos; but what about the shadow of it or its boom? If the rover finds a wallet, its mine. I left it there by mistake. I think it had a few hundred space bucks in it. Hah, I finally got a joke on a discussion Baord,,,Ferigy, Star Trek,Latinum. Please I hope I'm right.